More and more emails are being read on mobile devices. According to recent research by Litmus, over 35% of messages are now opened on a mobile device, up 80% in the last 6 months, and with the iPhone and iPad representing almost 80% of the mobile email clients. Who are they? Should you send them a message that is optimized for their devices? What if you want somebody on an iPad to receive an email that is optimized for them, and different from the message that is being sent to someone that’s typically reading a message on an iPhone? 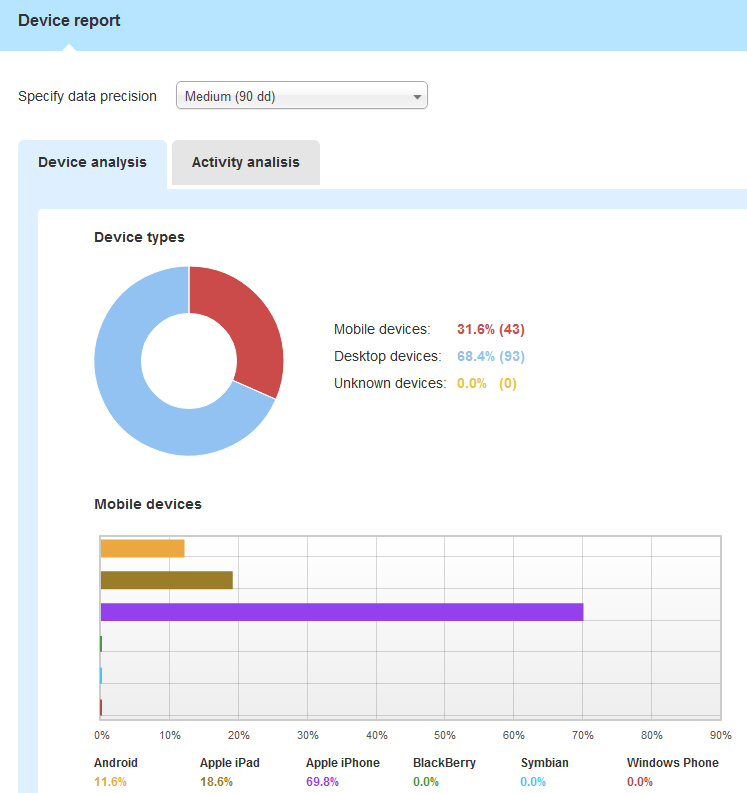 MailUp has an extremely useful “Device Report” that shows you statistics on the devices that your recipients are using to open the emails they receive from you. It also features “Device Filters” that allow you to target recipients based on the device that they typically use. So, how do you send a different message to different recipients, depending on the device they use to open their emails? There are two different approaches: one is to use the “@media” query to design HTML messages that adapt to different devices. Sounds complicated? If you’re not familiar with HTML and CSS, it sure will be. Another approach is to send different email messages to different recipients (i.e. messages of different widths), based on the device that they typically use to read their emails. One way to send a message that will look different depending on the receiving device is to use fairly sophisticated CSS code (Cascading Style Sheet) to change certain properties of the email depending on the device that is opening it. Specifically, by using the “@media” query together with the “max-device-width” and “min-device-width” properties in the styles used in the HTML code of the message, a savvy designer can change the look of the message depending on the device (see this handy list of @media queries that target different, standard devices). For example, the designer could change the width of the table/cells that contain the text and images, hide certain elements, show other elements, etc. The advantage of this approach is clearly that you only need to design one message (or one template that you use over and over for different messages), and the email will adjust itself automatically depending on the device that it is opened with. In MailUp, you can certainly load and send HTML messages that use the @media query. You can also design a message and save it as a custom template to be used for future emails. Another approach is to send entirely different messages to different recipients, depending on statistical evidence of which device they typically use to read their emails. Do they typically use a computer? Then you could send them a larger, multi-column message. Or do they typically use a mobile device? Then you could send them a narrower, single-column message. Device filters are based on historical data and make an educated guess on the device that will be used the next time a message is opened by the same recipient, but the message could be opened in a different device. In a sophisticated email marketing system like MailUp, there are different ways to send recipients messages that are optimized based on the device that they typically use to read them. Whether it’s using the @media query in the CSS code used to style the message, or by sending different messages to different recipients by leveraging “device filters”, you can improve your subscribers’ experience by delivering to them a message that will be easier to read in their preferred email client.